Table of Contents Next: Fraser, Bruce A. The French inadvertently played a major role in precipitating the Pacific War, but only a minor role in the war itself. France in 1940 had a colonial empire in the Pacific that took in French Indochina— roughly corresponding to the modern nations of Cambodia, Laos, and Vietnam — and the island groups of New Caledonia and French Polynesia. When metropolitan France capitulated to Germany in June 1940, Japan saw an opportunity to extend its power in southeastern Asia. The subsequent chain of events led to war between Japan and the United States, Britain, and the Netherlands. The fall of France came as a great shock in the United States. Willmott (1982) has described the Maginot Line, France's main fortified position on the French-German border, as "as much the shield of the United States as France". The political reaction in the United States was to begin serious rearmament, beginning with the Two-Ocean Navy Act that tacitly acknowledged that the naval disarmament treaties were moot and authorized massive expansion of the U.S. Navy. The French capitulation put Paris under German control, and the French government reestablished itself at Vichy in an unoccupied zone of France. Unsurprisingly, this government was dominated by extreme right-wing politicians who were sympathetic to Nazism. A counter movement, the Free French, grew up under Brigadier General Charles de Gaulle, the Under Secretary of State for National Defense and War, who opposed the French surrender and fled to London when France fell. 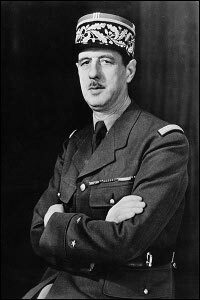 de Gaulle was determined to restore French honor by fighting alongside the Anglo-Americans while standing up for French interests. de Gaulle's Free French movement spanned the political spectrum; its flag, the Tricolor with a superimposed Cross of Lorraine, represented the union in common cause of the forces of Christianity on the right and the French Revolution on the left. In September 1940, the Japanese pressured the Vichy government into allowing them to station troops and use ports and airfields in northern French Indochina. When the Japanese expanded into southern French Indochina in July 1941, the United States, Britain, and the Netherlands responded with an embargo on oil that threatened to strangle the Japanese military in China. Japan responded with the attack on Pearl Harbor, the objective of which was to cripple the U.S. Pacific Fleet long enough to permit Japan to conquer the oil fields of the Netherlands East Indies and Borneo. With the coming of the Pacific War, the French colonies in the Pacific more or less fell in line with the side that was more powerful in their neighborhood. French Indochina, located deep in the Japanese sphere of influence, remained loyal to the Vichy government. The French governors of New Caledonia and French Polynesia were at least nominally loyal to the Free French movement. Neither side contributed much in the way of military forces to the war, though the bases at Noumea and Espiritu Santo were important to the Allies during the South Pacific battles, and the Richelieu was a welcome reinforcement to the British Far East Fleet. Relations between the Free French and the other Allies were not good. de Gaulle had a knack for antagonizing others that was further exacerbated by his insistence that France be treated, not as a defeated and occupied nation in need of liberation, but as a great power suffering a temporary reversal. Roosevelt was contemptuous of the French for submitting so easily to the Axis and regarded de Gaulle as an adventurer seeking dictatorial power. The Free French seizure of St. Pierre and Miquelon, small islands off the south coast of Newfoundland that were the only remaining French possessions in North America, threatened the American-Vichy agreement to maintain the status quo in the Western Hemisphere and was deeply resented. Roosevelt maintained diplomatic relations with the Vichy government until it was dissolved with the German occupation of southern France in November 1942. He hoped that this would allow the United States to exert pressure on Vichy to refrain from collaborating with the Germans and that American diplomats would become useful sources of intelligence. These hopes were largely frustrated, as were attempts to gain French cooperation in the occupation of North Africa. Vichy Admiral Jean Darlan did agree to a ceasefire in exchange for political control of North Africa, a deal that was widely denounced in Britain, the United States, and Russia. His assassination by a French royalist a few days later saved the Allies considerable ongoing embarrassment. Roosevelt's attitude towards the French may have been reflected by the OSS in French Indochina, which chose to work with Ho Chi Minh's Communist guerrillas rather than the Vichy administration, and by the refusal of Wedemeyer to aid French troops seeking to escape French Indochina following the Japanese coup on 9 March 1945.